The Shelter Corporation imagines a world of urban ‘forests’ - cities formed of timber-framed buildings. In our architectural and urban planning, we study and research our environment and environmental issues. In December 2015, the main hall of Nanyo City Cultural Center in Nanyo city, Yamagata prefecture, which has 1,403 seating capacity, has been registered as “Largest wooden concert hall” by Guinness World Records. This hall was built utilizing our constructive “KES® system” and fire-proof wooden technology “COOL WOOD®”. It produces high-quality comfort far beyond supposition, refreshing scent and soft feeling, the highest acoustic level in concerts and musical performances, humidification and temperature control unaffected by outer condition, for example, which are unique with “wooden” hall. The hall wins the great popularity with the citizens, audiences enjoyed the concerts, and famous artists furthermore. From custom-built housing to large-scale and multistoried timber building, over 40 years, we have been engaged in timber building, with the principle "Always seek the right answer", the business motto "Creation, Innovation and Challenge", and the entrepreneur spirit “Top-of-top quality of life”. We have continued to produce nationwide satisfactory results with the “KES (Kimura Excellent Structure) System”, which is innovative joint system in wooden structure using the metal connecters in junctions of post and beam, base and post and so on, fire-proof technology “COOL WOOD”, which is 1-hour and 2-hour fire-proof (fire-proof efficiency based on the Building Standard Law of Japan) structural wood member registered by Minister of Land, Infrastructure and Transport. And “Three-dimensional curved timber design and precutting technology”, which enables designers’ and creators’ image to shape to the form. Our custom-built houses and public buildings with KES system have been proof against Fatal Hanshin-Awaji Earthquake in 1995, and Fatal East Japan Earthquake in 2011, and have proved astonishing strength. 2-hour fire-proof COOL WOOD, which is unique technology to our company, is essential to build 14-stories wooden buildings. This technology is used for “Kyoto Mokuzai Kaikan”,which required 2-hour fire-proof in fire prevention area, for the first time in Japan. Furthermore, we introduce the newest three-dimensional timber precutting machine, and create the creative and beautiful design with multi-dimensional curved timber. “KES×COOL WOOD×Three-dimensional timber precutting technology”―they are the fundamental technologies for “Creating a forest in the city”, that is the creation of the cityscape with many wooden buildings, which is artistic and strong, disaster-proof. We provide their leading technologies, making them available, and coordinate the win-win business model “sixth sector industrialization supply chain”, promoting linkage of architect offices, forest owner’s cooperatives, timber pre-cut factories, and the building firms and so on. Wood is renewable resources that grows by absorbing CO2. Because grown-up trees absorb it less, it is necessary for us to cut down and plant the trees, then planted young trees absorb much CO2. The custom-built houses and timber institutions, by connecting the urban and rural, as well as fixing CO2 in the timber, creates the forest made by timber buildings in the city. In Japan, the usage of domestic timber is adopted by New National Stadium for the Olympic in2020, and “largest wooden concert hall” as well as Hōryuji Temple “Oldest wooden building” has been registered by Guinness world records. At last, begins the mega-trend of “Wood First”. 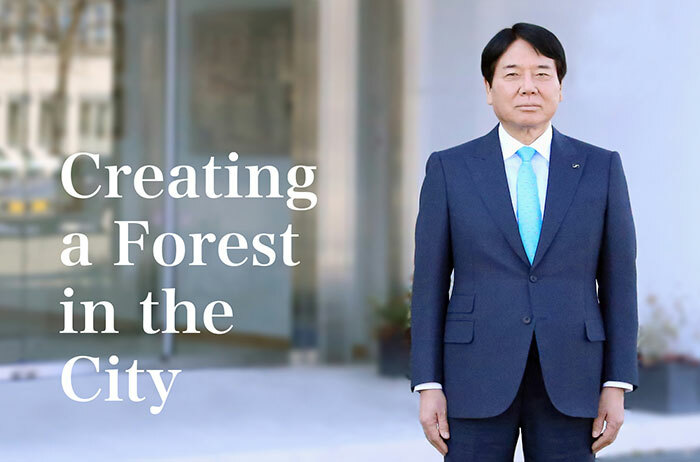 From Japan, the country of traditional timber building technology, we make full effort to spread the movement “Creating a forest in the city”, which promotes simultaneously, environmental future and regional revitalization. Copyright © SHELTER CO,LTD. All Rights Reserved.